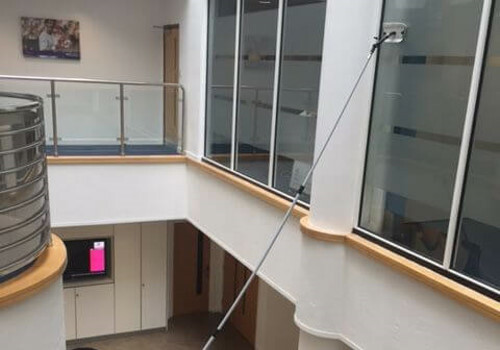 There are times when, due to the height or design of a building, or where specialist internal or external cleaning is undertaken that the use of a Mobile Access Tower or Mobile Elevated Platform is required. PASMA trained staff can erect mobile access scaffold towers on sites where other methods, such as ladders, MEWPS or telescopic poles are not an option. IPAF trained staff can utilise MEWPS such as cherry pickers, spider lifts, genie lifts etc, to clean larger jobs or inaccessible for water fed pole or other access. This may include cleaning buildings which are over 18 meters in height, or cleaning atriums, glass domes or hard to reach glass roofs. This requires specially trained operatives who have the necessary skills and experience to operate machinery properly, safely and effectively to minimise risk and ensure a safe working environment. In addition when working at heights over of 60 foot/18 meters this method guarantees that the job is completed satisfactorily. 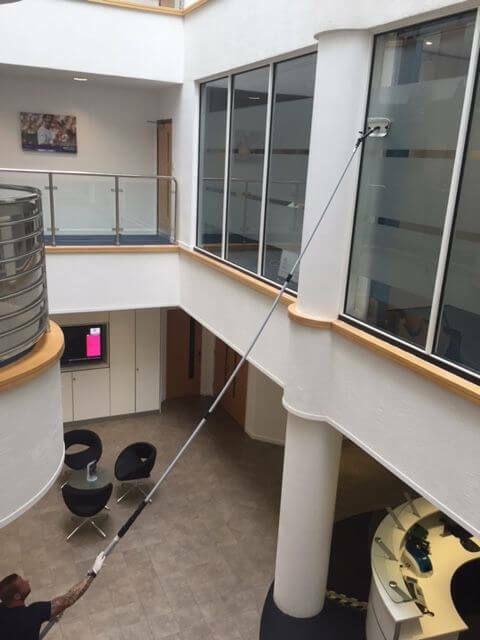 Our specialist internal window cleaning system can clean up to 45 feet without the need for ladders or specialist access equipment. A fine mist of pure water is dispensed to a microfiber cleaning pad using a simple belt mounted pump delivery system. This ensures that there are no drips or mess, and no extra sheeting or protection is required to internal furniture or flooring. This is a fast, clean, cost effective and safe solution to high level internal glazing which leaves a spotless finish. The use of the above methods ensures that cleaning at greater heights can be undertaken safely for our staff to complete their tasks. The methods also comply with the Provision and Use of Work Equipment Regulation 1998, The Health and Safety Act at Work Act 1974 and the Working at Height Regulation 2005. Our commercial clients also benefit from full Risk Assessments and Method Statements (RAMS) for all work being undertaken. Although we use pure water for 99% of our cleaning, a chemical may be required for specialist cleaning. Where cleaning chemicals are used, COSHH Risk Assessments will also be provided as part of our Health & Safety Management Pack.